For today’s blog we’ll be showing one of our triple shades (a.k.a Trilogy combi shades) customer from Lucena City. Combi shades fabric vary in its sheer and solid part in terms of design, texture, thickness of fabric and color. However, it usually only holds one color i.e. beige, brown, white, etc. The most distinct style of this Triple shade fabric is that its color is not one, or two color combination but three colors combined alternately. One thing to look out for when buying multi-colored window shades is that if you’re living in a condominium or high-rise residential building, you should first check with your building administrator if they allow this color combination. More often than not, only light colored shades are allowed. That means to say that this type of shades are better suited for bungalow houses or residential houses in subdivision where there are no rules as to what color you want for your window coverings. All but one has neutral colors, and the last one has shade of green for those who love the color of nature. 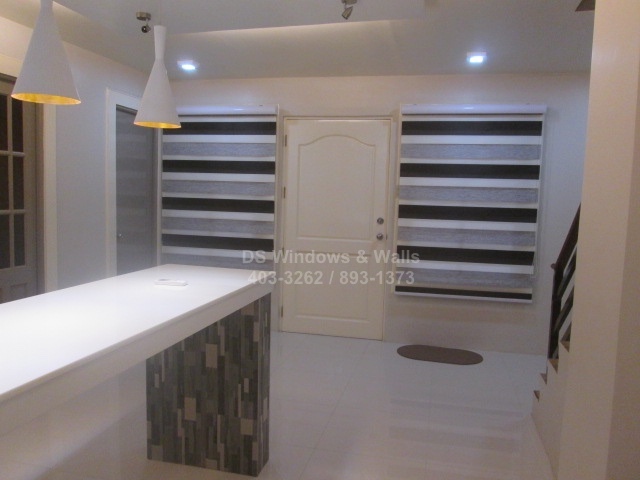 In this particular featured client, you’ll notice that he preferred the white, choco, and gray color (T621 Gray) which makes sense if you try to look around his room. A white tabletop, choco colored stair railings, and gray flooring that actually make perfect sense for his preferred combi shades color combination. For example, if you have plants inside your living room and loving it and at the same time has white colored ceramic flooring then T624 Green can be a sensible choice especially if you’re tired of monochromatic colored window covering. Our Trilogy combi shades is made of 100% polyester, its solid part thickness is 0.38mm. Its repeat pattern is 75mm on solid part, and 50mm on its mesh part. Its solar blocking is 79.70% which means it lets a little bit of sunshine suitable for living room or kitchen. 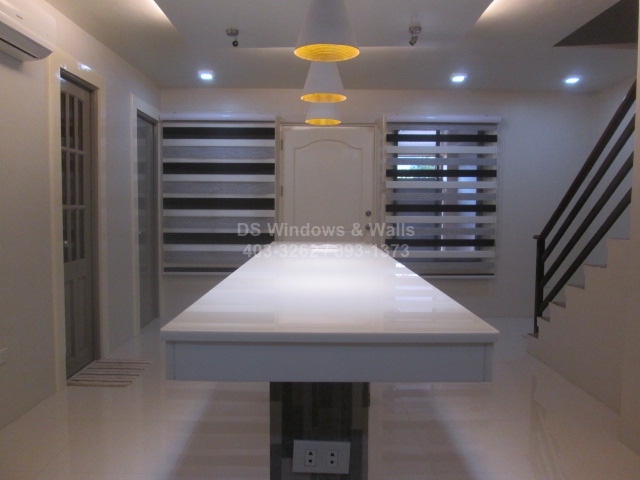 For more information of our triple shades (Trilogy combi blinds) you can call us at (02) 403-3262, (02) 893-1373, or (02) 668-9668 or email us at inquiry@dswindows.com. You may also visit us at our mall store branches. For Batangas, Laguna, Cavite area you may also call Patrick Villapando at the following numbers – (Globe) 0917-583-0214 or (Sun) 0922-592-6111 or 0908-989-4676.